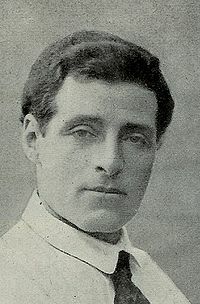 In present day Israel, Joseph Trumpeldor is a national hero, honoured as one of those whose influence over young Zionists forced the world to replace a promised national home in an Arab state with an independent Jewish state. So who was Joseph Trumpeldor? In the early years of the 20th century, at the age of 22, he was a Russian self-proclaimed anarcho-communist who abandoned principles and ambitions to defend his country when it came into conflict with Japan. Young men are prone to such padoxical actions. His excuse to his comrades? - He was combating the Russian stereotype of Jewish cowardice. The Russian army posted him, via the Trans-Siberian railway, four thousand miles away to Port Arthur, an ice-free naval base leased from China and the focal point of the Russo-Japanese dispute. When the Japanese eventually attacked Port Arthur, Joseph volunteered for the front-line commandos. There he fought with outstanding bravery until a piece of shrapnel severed his left arm. On leaving hospital, three months later, he requested permission to return to the commandos. "It is good to fight for one's country," he told a superior officer. "I have lost one arm, but my right one can still handle a sword or rifle." Joseph's request was granted but despite the commandos' gallant defence the Russian commanding officer surprised everyone, including the Japanese, by surrendering, so Joseph spent the following year as a prisoner of war. War over, he returned to Russia where he received four decorations for bravery including the Cross of St. George . A year later, he became the first Jew in the Russian army to receive an officer's commission, without having to convert to Christianity. 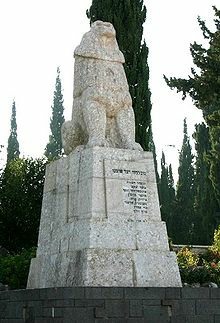 Joseph Trumpeldor, then, was a genuine Russian hero, but that does not explain why, in 1926, a massive basalt monument, featuring a roaring lion of Judah atop a giant plinth, was erected in his honour in Northern Galilee, nor why modern Israel honours him with an annual Commemoration Day, nor why thousands of contemporary Israelis make pilgrimages to his memorial. How did this Russian hero morph into an Israeli super-hero? To understand, we must backtrack to the last two decades of the 19th century. Joseph spent his childhood years in the Caucasus region of Russia. Close to his home, followers of Leo Tolstoy, the famous writer and social reformer, had created an experimental agricultural commune. This so impressed young Joseph that he became an avid reader of Tolstoy's theories. On reaching seventeen, the proceedings of the First Zionist Conference also engaged his enthusiasm. He envisaged constructing Jewish communes in biblical lands, a goal he had to abandon on enlisting. Becoming a prisoner of war freed him from constant pressure to act the gallant soldier. Conditions in his Japanese POW camp were nothing like those experienced by the British in WW 2. His captors allowed him to print a newspaper on Jewish affairs and organize history, geography and literature classes. Captivity allowed him time to plan a future with fellow Jewish prisoners with whom he shared his dream of founding communal farms in Palestine. When he eventually left the army, Joseph sailed with his friends to the Ottoman Levant where he worked in Jewish settlements learning the art of farming. His colleagues marvelled that this one-armed man could accomplish twice as much as any able-bodied labourer. The outbreak of WW 1 proved the pivotal point of Joseph's career. He refused Ottoman citizenship, so the Turks deported him to British-controlled Egypt. There he discovered a soul mate, a fellow Russian Jew named Ze'ev Jabotinsky. Together Joseph and Ze'ev recruited exiled Russian Jews as volunteers to fight in the Eyyptian based British army. However, its commander, Major-General Maxwell refused to enlist foreign nationals as fighting troops. Instead Maxwelll offered to form a Russian-Jewish auxiliary mule corps. Jabotinsky rejected this and left for London to lobby for a Jewish legion, but Joseph accepted and sailed to Gallipoli as Captain Trumpeldor of the Zion Mule Corps. In Gallipoli, Joseph again revealed heroic qualities. After being shot through the shoulder, he refused to leave the battlefield. His commander wrote that while many Zionists proved fearless under heavy fire, Captain Trumpeldor actually revelled in it. The fiercer it became the more he liked it. Over in England, Jabotinsky was successful in persuading the British to form an all-Jewish unit in the army, although its make-up had not been solidified by British army leaders. After the Zion Mule Corps was disbanded, Trumpeldor and 120 veterans from that unit went to England in 1916. Together, he and Jabotinsky convinced the British to create a small, all-Jewish unit called the 2/20th (County of London) Batallion, (Blackheath & Woolwich), which became the nucleus of the "Jewish Legion." Upon creation of that unit, Jabotinsky enlisted in the British army and was later promoted to Lieutenant when the "Jewish Legion" -- renamed the Royal Fusiliers -- was shipped to Palestine to fight against the Turks in 1918. Sometime after July, 1917, Trumpeldor left England and returned to Russia (he was still a Reserve Officer in the Russian army) to try and convince them to create all-Jewish defence units. His efforts failed, and when the Communist leaders took control of the government he was briefly arrested. Following this, he began working full time to create hachsharah farms -- as part of the He-Halutz -- to train Jewish youth in farming techniques and self-defence with the goal of preparing them to emigrate to Palestine after the war and start setting up new Jewish settlements (kibbutzim). In 1919, Trumpeldor returned to Palestine and was in charge of the defence of four isolated Jewish settlements in Northern Galilee, one of which was named Tel-Hai. At this time, all four were part of French-controlled Syria. France, at that time, was attempting to oust an Arab prince refusing to relinquish a temporary wartime governorship in Syria. The French were burning Arab villages. In return Arabs were murdering French Colonials. The Jewish communes remained neutral. When an occasional Arab band turned up at Tel Hai to check the commune was not sheltering French citizens, the commune leader would allow entry to two Arabs and accompany them during their search. On one such occasion, however, Tel Hai's commune leader was absent. His assistant allowed in the whole noisy Arab band. One terrified female commune member grabbed a rifle and shot at the Arabs from an upstairs window. All hell broke out. The assistant leader fired a shot to summon Trumpeldor's defence force. During the fighting Joseph Trumpeldor was mortally wounded. Seven others died alongside him. The commune was evacuated. So Joseph Trumpeldor died in an accidental fracas, and failed to save Tel Hai, but that was not how his friend Ze'ev Jabotinsky told it. Soon after the battle of Tel Hai, Britain and France rearranged boundaries, bringing abandoned Tel Hai into British occupied Palestine, and so eventually into the state of Israel. Jabotinsky created a new youth group, dedicated to fighting for a Jewish State in Palestine he named it after his friend Trumpeldor and propagated the legend of Joseph's heroic death at Tel Hai fighting against Arabs for a future state of Israel. The Youth Group, we now know as Betar, grew to international proportions. Joseph Trumpeldor's alleged dying words, "It is good to die for one's country" became indelibly printed on the minds of thousands of young Jews. Today Israelis of all Zionist persuasions take Trumpeldor as a role model. Right wingers revere him as a hero, willing to fight and die for his country; left wingers honour him as a pioneer willing to labour and live for his country. "It is no longer considered permissible for him (i.e. the military commander) to work his will unhindered, altering the existing form of government, upsetting the constitution and domestic laws, and ignoring the rights of the inhabitants." It was not until the 1920 Conference of St Remo that Britan was free and the evental handing over of Palestin by the Turks in 1923 that Britain was free to honour its pledge of 1917.